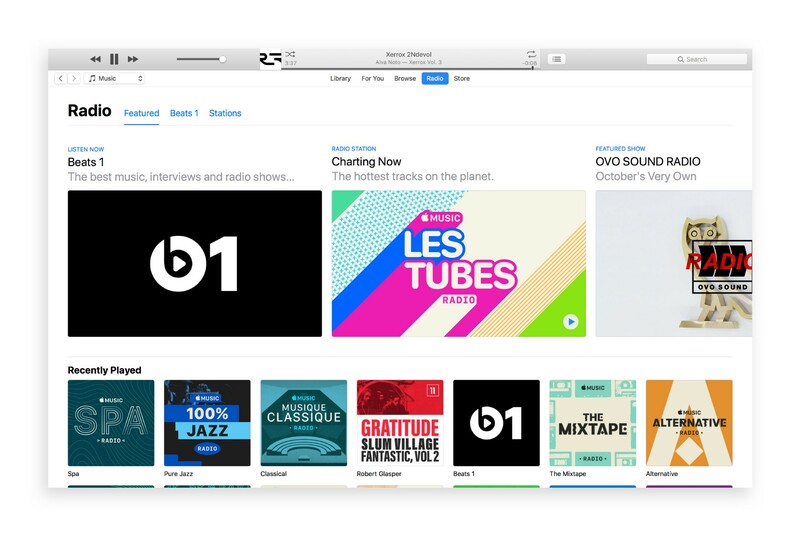 Apple Music is relatively new on the music streaming scene. 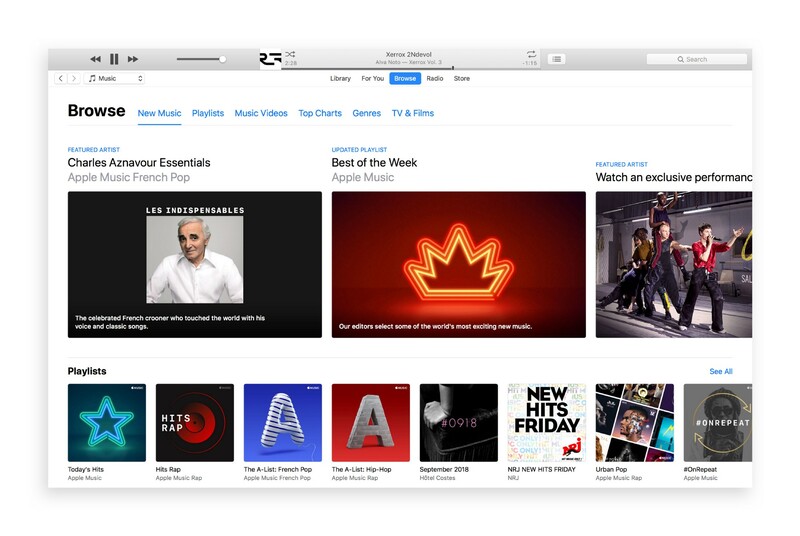 I subscribed from day one because A) it was integrated to the Apple ecosystem I was using everyday and B) I was conscious it was far from ideal but also curious to see how Apple would polish this and infuse their traditional design expertise. 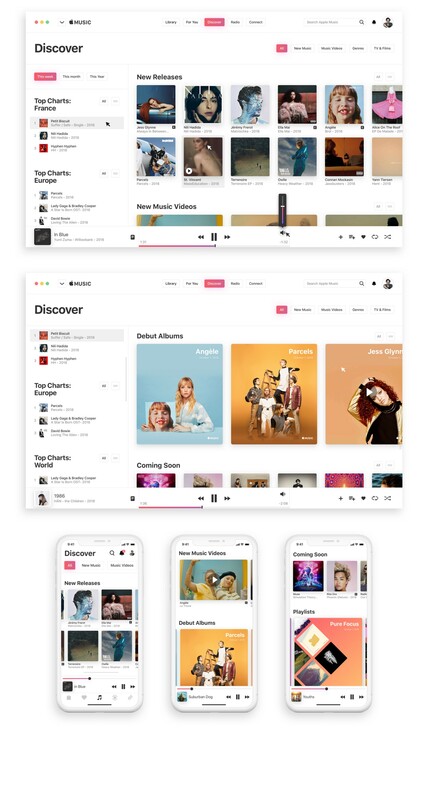 And this is slowly happening, the mobile app is driving every design iteration as new waves of users keep flowing in but it still feels clunky sometimes, and the desktop app especially needs a solid update. 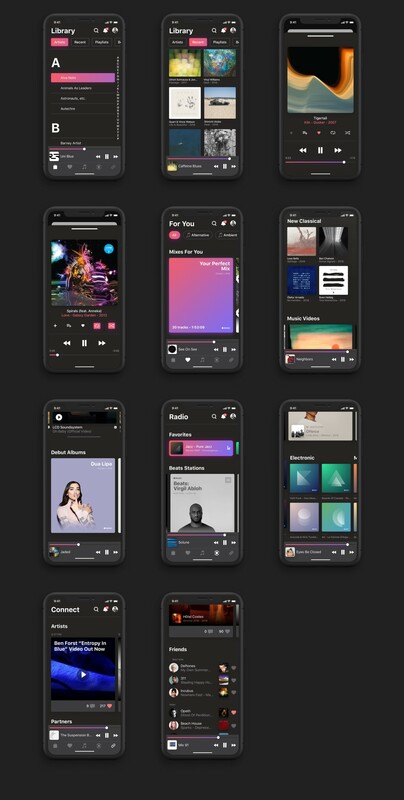 So I’ve been mainly focusing my attention on the Desktop app, but further down you will find some mobile screens as well. I’ve been using the app for a while now so this case study is mainly based on my own assumptions. However, about design and experience, I also talked to people and read many feedbacks. The header area feels like too much has been crammed in too little space. Although not dysfunctional, there’s too much going on here. 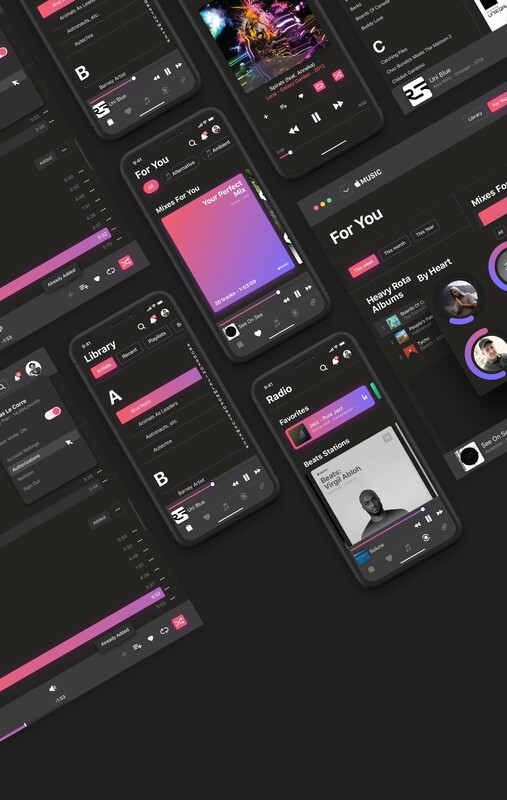 Proposal: Make a clearer distinction between app navigation and music player. Keep the app navigation at the top and move the music player to the bottom. Both navigation and player would immediately benefit from the split and this would apply to all other screens. The left-hand side grey column looks dated and I never thought the icons were adding anything more than visual noise. 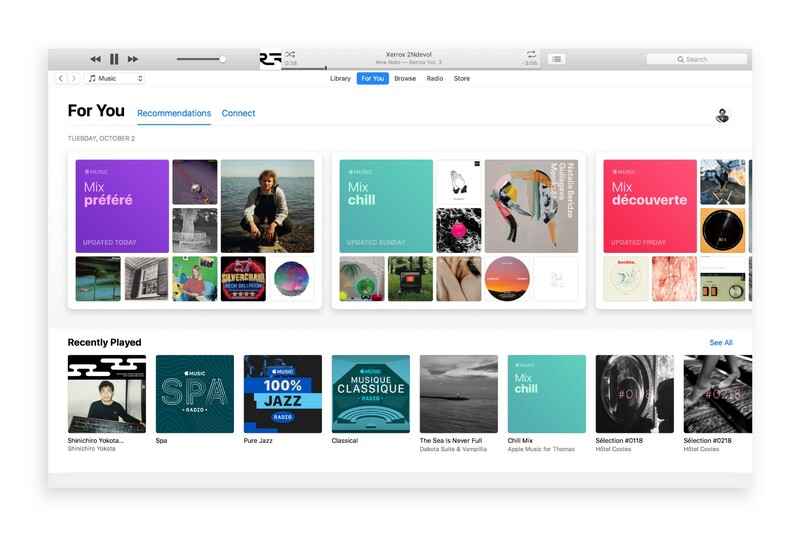 It is also a missed opportunity for consolidating navigation between albums, artists, recent, playlists, etc. and suggest something lighter. Proposal: Kill the grey colour, kill the icons and re-arrange left-hand side navigation. 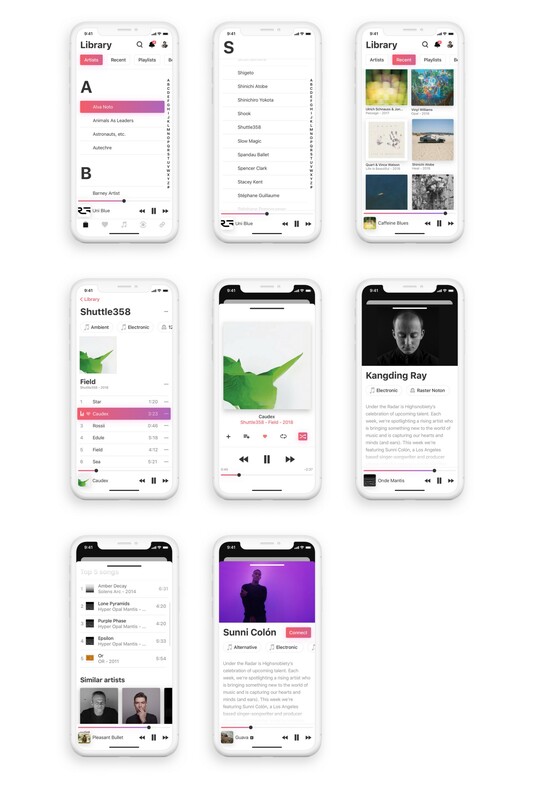 What’s striking at first with AM is the absence of branding, it is treated as another component of the Apple ecosystem with not much room for its own expression. It needs more personality, users pay for a service that feels like they’re opening any other built-in free app. Proposal: Bring the logo back and use the vivid brand colours as highlights, clean everything white. One thing I don’t like using in AM is the current search, which is a combination of what you could find in both your personal library AND on the whole AM library. 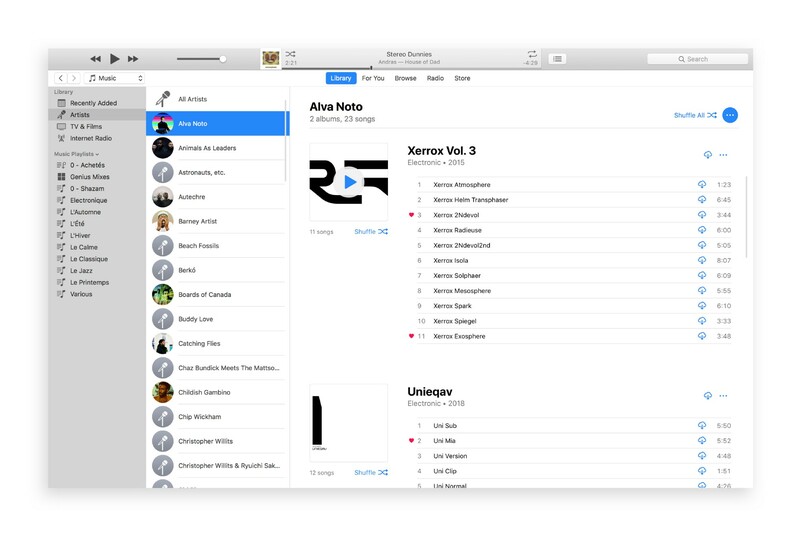 I dislike having to use this toggle “In Library” VS “All Apple Music”. Proposal: Have two search bars showing, clearly labelled and positioned so I never have to use a toggle anymore. Here’s the core page of the app I think, and so far the biggest missed opportunity. Recommendations tab: Those 3 Mixes at the top “Favorite”, “Chill” and “Discover” don’t take my mood into consideration and tend to serve me the same music genres over and over, as well as music I used to listen 10 years ago. Yes it’s packed with things I like but without the dimension of right timing. Proposal: Introduce Music Genres Tags, top right as filters for the mood I’m in. If this was made for me, then let me take control of the content I see here. This page needs to be alive, I want to be able to make it mine, customise it, choose genres I’m into at a certain time and also be able to adjust as my tastes evolve. Connect tab: I simply never click this tab and it might have to do with style, prominence and content. Proposal: Remove “Connect” from this page and create a dedicated page to give the “Connect” feature a proper chance. “Recently Played” is unnecessary, Suggested Playlists and Albums feel a bit random and “Heavy Rotation” could do more. Proposal: Kill “Recently Played”, sort Suggested Playlist and Albums by genre and develop “Heavy Rotation”, providing stats about most played albums, songs, genres as well as a time dimension, by week, month or year. Getting older, I miss the pre-internet relationship I used to have with music. 20 years ago, listening to something was serious business for me. Buying tangible Cds I would play for months to the point they would turn into a special memory. I genuinely do miss this patience. Nowadays, I can barely remember what I listened to last week. Proposal: Introduce “By Heart”, a silly little feature that values patience and help focus on knowing an artist’s discography really well. It would watch and digest how much you listen to something and reward you with funny data around it. This is completely gratuitous. “Browse” is a section I rarely use, most of the time it’s filled with cards I never click. But being open-minded about it this is precisely what this section is about: Lead you to places you would not consider first. So it’s not about changing content but rather about giving a bit of air to the page. Proposal: Change name to “Discover” for it feels slightly more adventurous than “Browse”. Use taller tiles, larger space between elements, clearer navigation system and… less content. I listen to AM Radios a lot, and again same problem occurs I always get to see what Apple wants to push: Beats & loads of commercial soup. I’m not in control when what I want is be able to quickly find the 3 or 4 radios I keep on playing all the time. I also want to get some stuff out of my way forever. Detail: I never know what’s playing on a radio unless I start playing it, I think showing current song upfront is a cheap and easy fix, would that happen through visuals, copy or both. Proposal: Favorites left-hand side column, where I can put and arrange my most listened radios I keep coming back to everyday. Tags, so I can filter down what I want to see and eliminate all the irrelevant radios I never click. Sort small radios thumbnails together by genre. If it was only me using the app, I’d remove the whole social media thing. 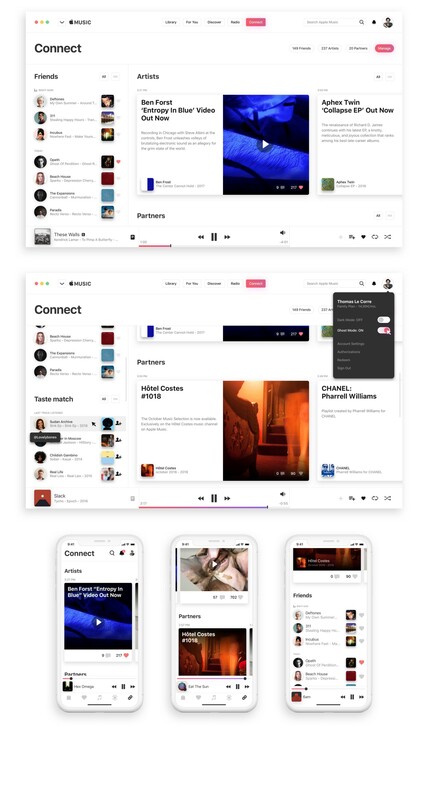 “connect with artists” , “find friends” … these overheard jargon lines almost upset me now, social media personal tolerance reached. Talking to people also confirms a majority actually feel this ubiquitous social media fatigue. There are just enough social networks out there and I don’t think I need another one in my life. BUT, on another hand it’s 2019 tomorrow and, although it would be brave not to, I guess a worldwide company can’t do without sprinkling a bit of social powder. So let’s embrace a proper “Connect” section and make it wide, clean and as relevant as it can be. Proposal: Friendship-focused left-hand side column consisting of “Friends Activity” and “Taste Match” to interact and meet people you get along well in music. Bigger blocks for Artists news, more room for copy, a dedicated space for visual communication or media, a classic like/comment area and a quick access to the latest album, bottom left. A “Ghost Mode” for the ones who want to stay under the radar. Drag and drop any module within a section, rearrange them the way you want. This option felt like the simplest way to a more user-centric app. 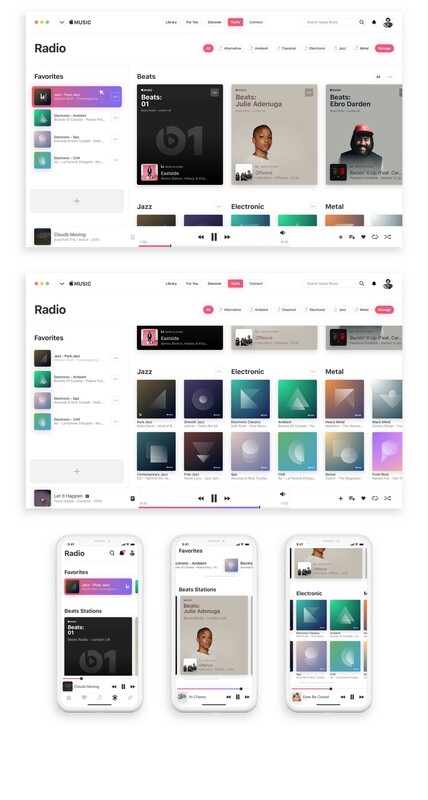 I would love this to happen, that would make me feel in control and also contribute to building a more organic and flexible app, evolving with the user’s mood and taste.